Whether it’s a small dinner party, a moderately attended anniversary shindig, or a whole shebang wedding, there’s one thing that deserves a little time and effort: the centerpiece. Waiting until the last minute to decide on an arrangement, or selecting one after minimal research, could come back to haunt you in the end. When selecting floral centerpieces for your event, there are several factors to keep in mind to make sure they do more good than harm. Once you have an idea of how many tables will be at your event (including buffet, reception, and decorative tables) you can use that number to determine how many centerpieces you’ll need. Divide your budget by that number to determine how much you can spend on each centerpiece. You can play around with this number a little bit, as well. For example, if you spend a little less on your guest tables, you’ll have more money to spend on a grand arrangement for the reception or entrance table. If your budget isn’t as friendly as you thought it would be, consider using less tables that seat more people or utilize flowers that are in season to save money. You definitely want to look into your venue’s rules and regulations before you make any big decisions. Many facilities have restrictions on open flames, breakable glass, or certain common allergens. Occasionally, hosting sites will have restrictions on what vendors you can use as well. Checking for these limitations beforehand will prevent a last minute fiasco from ensuing. Some venues also have rules about who can set up and clean up, so keep those in mind when selecting your arrangements as well. The shape of the table should be one of the biggest factors you consider when deciding on centerpieces. For a round table, centerpieces should be round and look good from all angles. Square tables are compatible with either round or square. You can use your vase shape to dictate the shape of your bouquet: a round vase will create a round arrangement, a rectangular vase will coax flowers into an oblong shape, etc. When it comes to rectangular or oval tables, you have more room to play around. The longer the table, the more arrangements there should be. Selecting bouquets of varying heights has a very aesthetically pleasing effect, and you have a little more space to play with shape and color. Height is also an important factor relating to table shape. If the tables are round, twelve to fourteen inches is ideal. You don’t want the centerpiece to block their view of each other and impede conversation. You can use taller arrangements on buffet or reception tables, and also on long rectangle tables if they’re placed between seats so as not to impede guests’ views of the dance floor/ceremony/etc. The size of the table is another important factor to consider. You may want grand arrangements that serve as statement pieces, but for smaller tables, or tables that will be filled with place settings, place cards, glasses, and water pitchers, these won’t be functional at all. If your tables are going to be smaller or somewhat crowded, save the more elaborate bouquets for tables that are not meant for seating and go with something more understated for the smaller settings. You’d be surprised how elegant a simple rose bouquet can look. The number of tables that will be utilizing a centerpiece will play a factor in the variety you choose. Of course, entry, reception, and buffet tables always look great with contrasting or otherwise different arrangements on them. However, for the general seating area, it’s best to stick to one single style if there are ten or less styles. If there are going to be more than ten tables, you can definitely pull off a “layered” look if you do it right. 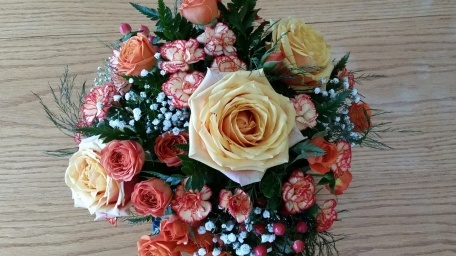 This would entail different bouquets in different areas of the room. You could try an ombre effect by using darker colors at the back of the room and slowly fading to white or a lighter version of the base color at the front. 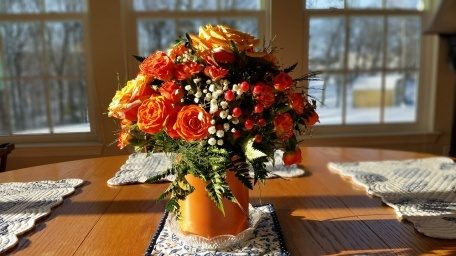 Or, consider using contrasting colors and different flowers and styles. As long as everything coordinates well together, a varied look can really brighten up a larger reception area. The lighting of the area should be considered when designing your centerpieces. If the room is going to be dimly lit, consider adding candles (flameless or otherwise) or electronically-lighted “foliage” as part of your arrangements. For poorly lit areas, you definitely want color, but it’s better to go with jewel tones or deeper shades than brights or pastels. If you are going to be in the sun or under harsh fluorescent lighting, color is good, but it’s best in pops or as an accent. White or a pale pastel with a few vividly colored tropical flowers will look outstanding in brightly lit conditions. 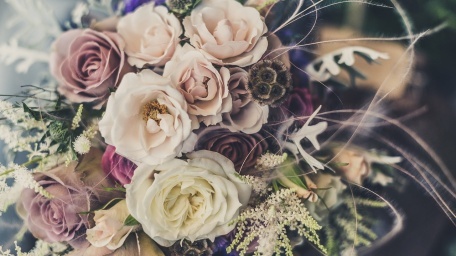 The temperature and humidity can greatly affect the lifespan of your flowers, and should also be taken into account when including wax candles or anything edible (especially chocolate) in your arrangements. Talk to your florist about what flowers do well in different environments. Roses are pretty hearty under almost any circumstance, but hydrangeas can become wilted and useless in less than three hours under the wrong circumstances. The last factor to consider is your guests. This shouldn’t be hard for a dinner party or family gathering. When it comes to a large event like a wedding or fundraiser, you simply can’t take everyone into account. However, when it comes to close friends and family, it will mean a lot if you consider them when selecting your centerpiece. If someone is allergic to pollen, use low-pollen flowers, lots of foliage, or don’t use flowers at all. If someone is allergic to a certain type of flower, definitely stay away from it all together. 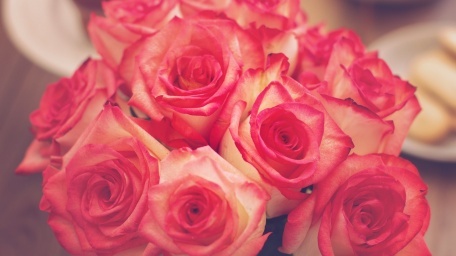 If you know someone is extremely sensitive to scent, pick flowers that don’t have a strong smell. There are a lot of factors that go into picking the right centerpieces for your event, but you can still have fun with color and variety. In the end, you want to make sure everything coordinates and matches your theme or personal style, so don’t get too crazy about restricting yourself, and don’t forget to have fun. We're a unique flower delivery company. Same Day Delivery in Manhattan and Next Day Delivery in most cities in the Northeast. This is our blog.